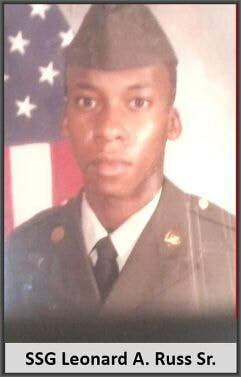 SSG Leonard A. Russ Sr.
Died: February 13th, 1991, Operation Desert Storm.. Sergeant Leonard Allen Russ, Sr, age 26, stationed at Fort Campbell, Kentucky, died February 13, 1991 from injuries received serving in Desert Shield/Storm. Sergeant Russ was born September 11, 1964, in Newport, Rhode Island to the late Charles H. Russ and Mary L. Donnie. Sergeant Russ attended the Pleasantville, NJ School System and graduated from Pleasantville High School in 1982. He joined the United States Army in the summer of 1982. He was a member of the Special Forces (The Green Berets). He had served in the army for eight years and was airborne. He was awarded two Good Conduct Medals, an Army Service Ribbon, a Citation for overseas service, a Non-Commissioned Officer Special Development Citation, an Army Commendation Medal, two Army Achievement Medals, and several Letters of Commendation.